While childhood obesity rates are starting to level off, severe obesity has increased, Kelly said. Severely obese children have higher rates of type 2 diabetes and cardiovascular issues at younger ages, including high blood pressure, high blood cholesterol and early signs of atherosclerosis - the disease process that clogs arteries. Treatment options for children with this level of obesity are limited, as most standard approaches to weight loss are insufficient for them. The statement defines children over age 2 as severely obese if they either have a body mass index (BMI) that's at least 20 percent higher than the 95th percentile for their gender and age, or a BMI score of 35 or higher. A child in the 95th percentile weighs more than 95 percent of other children of the same gender and age. BMI is a measurement based on weight and height. Age- and gender-specific growth charts are used to calculate BMI for children. Children at the 95th BMI percentile or higher are obese, and those between the 85th and 95th percentiles are overweight. A 7-year-old girl of average height weighing 75 pounds, or a 13-year-old boy of average height weighing 160 pounds, would be defined as severely obese. Most experts recommend a step-wise approach for treating severely obese children, with treatment getting gradually more intensive from lifestyle changes, to medication and potentially surgery. "But the step from lifestyle change and medication to surgery is unacceptably large because weight loss surgery isn't appropriate for or available to all severely obese children," Kelly said. The statement calls for "innovative approaches to fill the gap between lifestyle/medication and surgery." 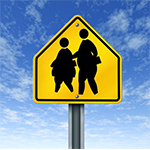 • recognize severe obesity as a chronic disease requiring ongoing care and management.